Tuesday September 4th, 1973: Yogi Berra's New York Mets were in 5th place, five & a half games out of first place, the only team behind them were the Philadelphia Phillies. That night, the Phils came to Shea Stadium as a small crowd of 13, 000 came to see Jim Lonborg (12-12) go up against Tom Seaver (15-8). Tom Seaver was coming off two straight losing decisions, but tonight would be different. Tom Terrific pitched a complete game five hit, one run victory, blowing 13 Phillies away with strike outs. The 13Ks were Seaver's second highest single game total on the season. Seaver sent the Phillies Mike Schmidt down swinging three times & slugger Greg Luzinski down twice. The Mets started out with Wayne Garrett leading off with his 11th HR of the season. In the 3rd, Garrett doubled & scored when Felix Millan reached on an error. Then Rusty Staub walked & John Milner singled to left scoring Millan. ﻿Wayne Garrett Ed Kranepool then followed with a triple driving in two more runs & Jerry Grote's single made it 6-0. The Mets never looked back adding another run in the 7th when reliever Mike Wallace threw a wild pitch to Wayne Garrett scoring Bud Harrelson from third base. Wednesday September 5th, 1973: The next night 12,500 came to Shea Stadium to see Ray Sadecki (3-3) get a start against Wayne Twitchell (13-7). Sadecki had started the year as a reliever but since early July, had been in the rotation going 3-3. Tonight Sadecki was at his best, he pitched three hit shutout ball into the 6th inning. In the 6th he walked Greg Luzinski & Mike Schmidt, that being his fifth walk of the night. Manager Yogi Berra came out, as Sadecki was relieved by Tug McGraw. With two outs McGraw walked Billy Grabarkewitz but got pinch hitter Cesar Tovar to fly out ending the inning. McGraw would roll along and finish up the game, shutting down the Phillies for a combined shut out win with Sadecki. McGraw went 3.1 innings, allowing just one hit & one walk, striking out two while earning his 16th save of the year. McGraw who had struggled all year, was finally pitching well over the past two weeks. With strong starting pitching a now McGraw holding able to shut teams down in the final innings, the Mets were a tough team to beat. On this night the offense put up four runs, with Rusty Staub starting it off with his 12th HR of the year, coming in the 1st inning. A crazy 5th inning had Twitchell walk Wayne Garrett & John Milner. A Mike Schmidt error had Felix Millan reach safely & then a wild pitch to Ed Kranepool scored Garrett. Garrett added a two run triple down the right field line in the 6th, scoring Jerry Grote & Bud Harrelson to make it 4-0. Friday September 7th, 1973 (game one): Friday night brought the Mets to Canada to face off against the Montreal Expos for a twi-night doubleheader. 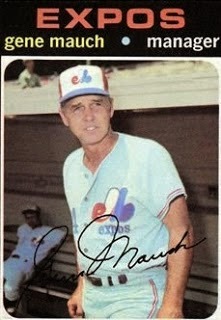 Gene Mauch's Expos were one half game ahead of the Mets at this point, so this was a big series at Parc Jary. The Expos sent former Met prospect; Steve Renko (12-11) to the mound. Renko was one of the players traded away in June 1969 to acquire Donn Clendenon. 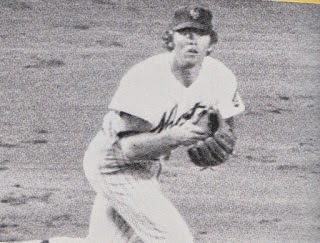 The Mets sent Jon Matlack (11-15) to the mound, who was much better than his record showed. This was a classic pitcher's duel, with Matlack going to the 9th inning, shutting out the Expos to just five hits, while striking out seven along the way. Renko gave up a leadoff HR to Wayne Garrett in the 1st inning, Garrett's 12th HR of the year. The third baseman had now settled in the Met line up as the clubs main third baseman. This was after the whole Jim Fregosi debacle had ended in early summer. The Red headed third baseman would hit 16 HRs on the year, second best on the club. It would be the only run Renko allowed & one of just six hits, but not enough to beat Matlack in this game. Both pitchers did struggle with control, as the each walked six batters. In the 9th Matlack walked Pepe Mangual & former Met Mike Jorgensen with two outs. Tug McGraw was called in to put out the fire, as closers in those days were called "firemen". He did so by getting former Met Ron Hunt to ground out to the mound. 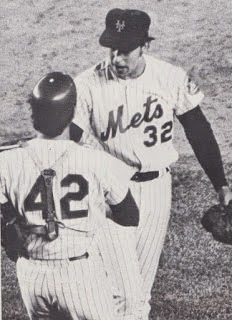 Friday September 5th, 1973 (game two): In the nightcap, the Mets sent Jerry Koosman to the mound to face off against Mike Torrez. Both pitchers did well giving up a run each, but were long gone when this game ended in the 15th inning. 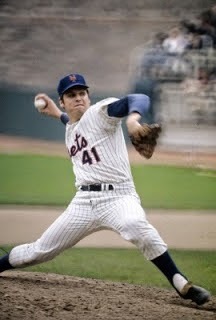 Koosman gave up an RBI single to Bob Bailey in the 3rd inning, he would pitch six innings allowing four hits. As for Torrez he would make his own trouble by walking Met batters. Walks would always be a problem for Torrez in his long career, something that drove Expo Manager; Gene Mauch crazy & got Torrez him traded. On this night, in the 7th inning, after Jerry Grote reached on an error with two outs, he then walked Don Hahn & Bud Harrelson. Mauch let him pitch to Ken Boswell who he also walked tying up the game. Mauch was furious, he went to his bullpen & brought in work horse Mike Marshall, who was one of the best relievers in the game in the early seventies. Marshall would pitch 8.1 innings and give up eleven hits before taking the loss in the top of the 15th. In the 15th McGraw did allow a run, and got into some trouble. After retiring the first batter he gave up a single & a walk, then Mike Jorgensen doubled home a run. Ray Sadecki came in to replace the tired McGraw & struck out Pepe Mangual & got Felipe Alou to fly out ending the game, with the Expos bases loaded. 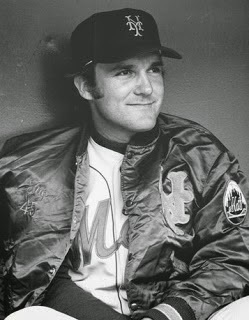 Tug McGraw earned his third win in two weeks (3-6) and the Mets jumped ahead of Montreal to fourth place just four games out of first place.